Dodgers release Miguel Olivo, two days after brutal fight with teammate Alex Guerrero. 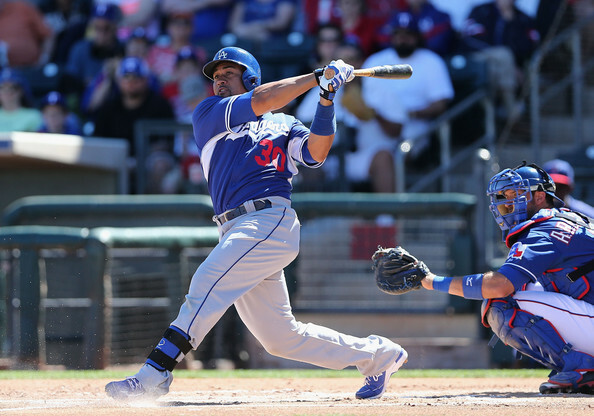 The Dodgers released Miguel Olivo on Thursday, two days after the catcher slugged teammate Alex Guerrero and bit off a portion of his ear in the middle of a Triple-A game in Salt Lake City, Utah. Olivo had been suspended by the Albuquerque Isotopes on Wednesday. The Dodgers have 39 players on their 40-man roster. The 35-year-old was only added to the Dodgers’ 40-man roster in April after a somewhat tumultuous spring training. Olivo signed a minor-league deal with the Dodgers in January and received an invitation to the major-league camp. Despite batting .263 (5 for 19) in limited Cactus League playing time, Olivo was returned to the minor leagues as the Dodgers opted to keep three catchers (A.J. Ellis, Drew Butera and Tim Federowicz). Olivo requested his release at the time but ultimately accepted an assignment to Albuquerque, where he batted .368 (28 for 76). After Ellis was placed on the disabled list and Federowicz struggled to hit major-league pitching, the Dodgers purchased Olivo’s contract May 1 and let him start six of the next 10 games. But Olivo struggled to hit too. He struck out nine times in his last 13 at-bats while failing to collect a hit. When Ellis was activated from the disabled list May 14, Olivo was optioned back to Albuquerque. Tuesday marked Olivo’s fourth start since returning to the minors. Guerrero is staying in a Salt Lake City-area hospital after undergoing plastic surgery Tuesday to re-attach the missing portion of his left ear. He is expected to be out long-term; one report Tuesday pegged the timetable for recovery at five weeks. Guerrero hasn’t decided whether or not to file criminal charges against Olivo. More details about the incident can be found here. This entry was posted in Breaking news, JP on the Dodgers and tagged Albuquerque, Alex Guerrero, Miguel Olivo by J.P. Hoornstra. Bookmark the permalink.